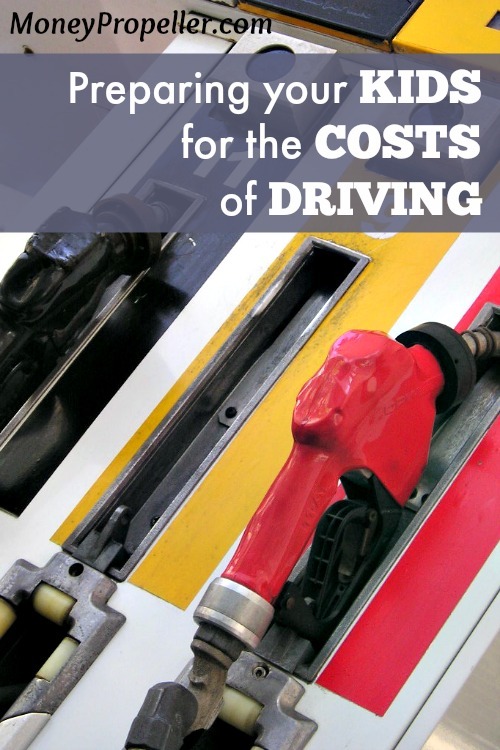 The costs of driving, as any car owner knows, include much more than putting gas in the gas tank. When I was a teenager without a car of my own, I did what many kids did to get around town — I either rode my bike, hitched a ride with a friend, or borrowed my dad’s car. With a family car, I was on the family auto insurance plan, so I didn’t have to worry about paying for car insurance. I only had to pay for gas. But I had an idea of the expenses of oil changes and other maintenance costs, and I had no idea how other kids could afford to drive a car. I couldn’t afford a car if I wanted one, and what little money I did save was either spent quickly on weekends or saved for college. I wasn’t ready for the costs of owning a car, and spent the first few years of ownership after college graduation spending much more money on a car than I could afford to. You can’t prepare your kids for everything in life, especially financial hardships, but preparing them for the costs of driving is easy if you sit them down and have them look at the numbers. Before getting into the details of the costs of car ownership, show them an online calculator to determine the costs of a car loan. A used car loan will have a higher rate than a new car loan, even if it’s for two less years than the new car loan. This monthly payment figure is just the start of how much they’ll have to pay to own a car. It’s probably the biggest cost, but it’s just the start. A car loan of $250 a month or more is reasonable, though it can be less with a bigger down payment. That’s another area to prepare them for: The down payment. The more money they can put down, the lower the monthly payments will be. And I stress that “they,” the student, pay all of these costs. It’s their car and their responsibility, so paying for it is part of the joy of driving. Next, ask your auto insurance agent for a quote on the monthly cost to insure the car. It may be lower if your child is on your policy, but their driving record will also be a factor. This will likely be the second largest expense, though it could be counted as the third highest if the down payment on the car is considered the largest. Now we get to the direct costs to the driver. These are expenses that add up throughout the year, and which drivers might not think about because they come a little at a time. Some, such as tune-ups and other regular maintenance including new tires, can cost $500 or more and can be more easily taken care of by putting money into a bank account each month that’s set up to pay for auto repairs. Commute Solutions, a program of the Santa Cruz County Regional Transportation Commission, a regional transportation planning agency, lists the direct cost of driving at $1.01 per mile driven. Here’s how it’s broken down: Fixed costs such as insurance, registration and motor vehicle taxes are 11.9 cents per mile; finance charges are 6.3 cents; depreciation is 27.9 cents; fuel is 18.4 cents; maintenance and tires are 5.3 cents; residential parking is 6.7 cents; parking and tolls are 2 cents; travel time with average delays is 11.3 cents; and accidents for the personal costs of injury and property damage are 10.9 cents. The agency also lists 39 cents per mile in indirect costs, including government-paid cleanup of accidents and air pollution damage. If you just take the $1.01 per mile driven in direct costs, driving 12,000 miles per year costs $12,120. That’s about $1,000 a month to run a car. Add $250 in monthly car payments and a conservative estimate of $100 each month for insurance, and it’s $1,350 per month in direct costs to drive a car, not including however much the teen put toward a down payment. AAA has found the direct costs of car ownership to be much cheaper than Commute Solutions did. For drivers who put a fair amount of miles on their cars each year, the average costs per mile decrease. A report by AAA in 2013 on driving costs found that the average cost per mile of driving a sedan was 78.3 cents when 10,000 miles per year were driven. That expense dropped to 60.8 cents per mile at 15,000 miles, and 51.9 cents at 20,000 miles. Commuting to work by car costs about $61 in total vehicle expenses per 100 miles, according to AAA. There are also costs that aren’t factored in to these calculations, such as the deductible you’ll probably have to pay if you get into an accident and need your car repaired. Accidents happen, and even if they’re not your fault, you can still get stuck with the bill if the other driver leaves the scene after hitting your car door and not leaving a note. Whatever your teen’s costs turn out to be for driving a car, getting them prepared for the many expenses will help them set a monthly budget to pay for the costs. It will give them a goal to reach each month instead of just worrying about the price of a gallon of gas. Aaron Crowe is a freelance journalist who specializes in personal finance writing and editing, including at his websites at CashSmarter.com and Add-Vodka.com. When I was a kid, my parents always complained about how gas is expensive. So when it was my turn to gas up, I drove consciously and efficiently to save on gas costs. Nice. Gas can add up really quickly. Having your dad do the maintenance would help with costs so, so much! I started driving when I was 16. My father taught me and let me know about cars. But he never taught me about the costs of driving. I agree that we should prepare our kids about buying a car at an early age so that they know better about the pros and con. Cars can get expensive, quickly. Driving is only one of the skills involved with cars! I definitely was not prepared for how much driving (and owning a car) costs. I grossly underestimated how much gas my car consumes, and more or less forgot to account for any maintenance fees or repairs. I think some of the costs are a little inflated here, but it can add up. $0.279/mile for depreciation?!?! 100,000 miles lands you at $28k. I guess it all depends on how long [or far] you actually use the vehicle and how much you actually spend. I used to bike and take the bus, but we felt like I was missing out too much with the kiddos. Transportation is expensive regardless how you slice and dice it. My brother and SIL enjoy their time commuting together for the conversation opportunity. When you say that you missed out too much with the kiddos was it because the other transportation was taking too much time, or because you weren’t spending time in the vehicle with them? I was spending a significant amount of time away from my family, who is at home. It took me 20 mins to walk from where the bus dropped me off to work, and I am 30 mins door to door when I drive. So, I went from spending 2 hrs a day commuting to 1 hr/day. Which essentially bought me an extra hour with my kids. I can only intellectually understand how hard it must be to let kids drive, I’m sure it’s stressful for parents. I’ll have two new drivers shortly. A great topic to cover with them. Insurance costs for young drivers can be a big expense. HUGE expense! Teenager drivers get insane insurance bills. I am already bracing myself for the day my kids start driving! Fortunately, that is not something I have to worry about yet. Agree! Prepare them now so they can be equipped when making big decisions such as buying a house or a car.